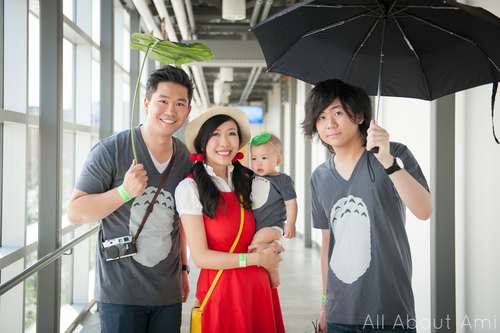 We love Miyazaki’s classic “My Neighbor Totoro”, and I thought it would be so cute to dress Myla up as the sweet little girl “Mei”! However, Myla does not like wearing hats (she rips them off right away) and she does not have much hair. 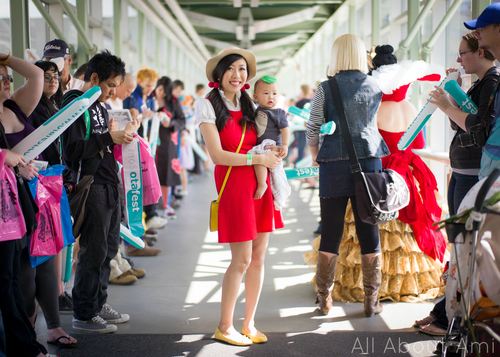 In addition, I knew it would be difficult finding the pieces necessary for Mei’s costume for a baby. And so, I decided that I would dress up as Mei and Myla would be Totoro! 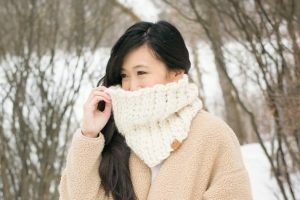 This is what Mei looks like in case you have not seen the movie! 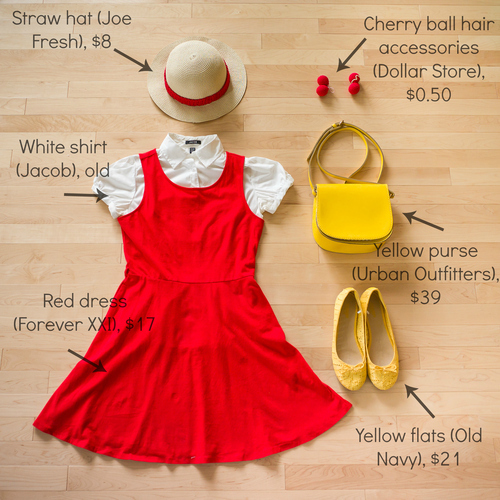 I was the most excited to find the perfect red dress which was only $17 at Forever XXI! The yellow purse was more expensive than I had hoped, but the shape was perfect and I knew that I would wear it in the future and not just for my costume…same with the flats, which turned out to be super comfortable! My floppy straw hat from Superstore (Joe Fresh) was the wrong shape, but Ryan helped me cut it to make it more Mei-appropriate! He also glued the edges to prevent it from fraying. The hat also needed red trim so I crocheted a long red strip! I wanted to dress up as closely to Mei as possible, so we couldn’t forget the cute cherry balls that she wears in her hair! 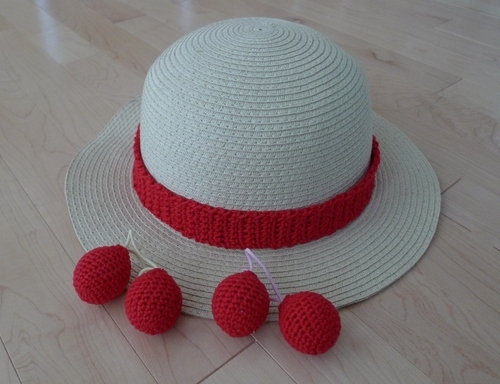 We found this set of four ball hair ties at the dollar store- unfortunately there was no red, but I knew an easy solution: crochet around it with red yarn! I started off with the magic circle and crocheted round by round, measuring the piece to the ball as I continued. The finished piece looked cylindrical, but it stretched snugly around the ball! When I was close to finishing I decreased around the end. 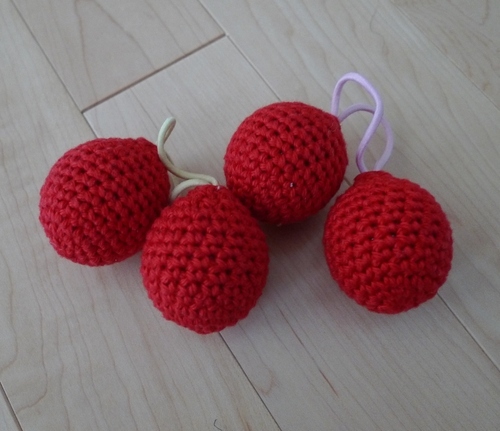 Here are all the completed cherry balls! And here are the crocheted pieces of my costume: the red strip on my hat (which was not visible in the sneak peek so that was tricky!) 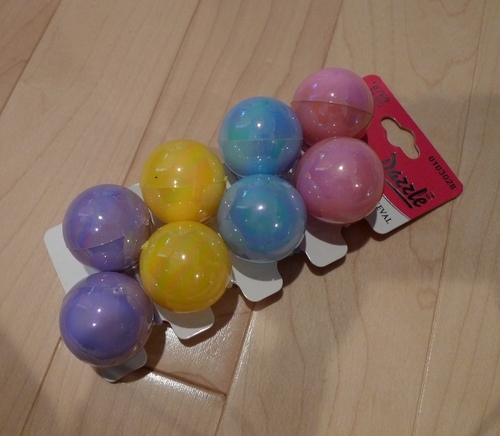 and the cherry balls! 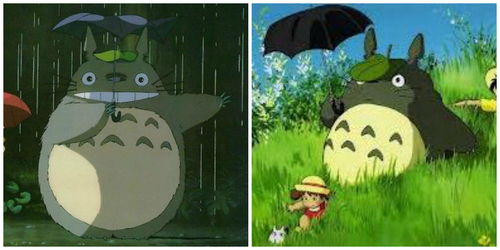 For those of you who do not know what Totoro looks like, here is a picture! 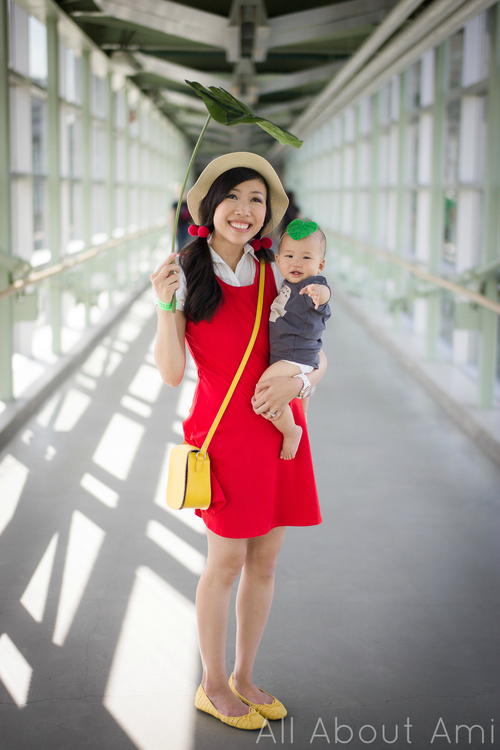 His signature accessories are a leaf on his head and a black umbrella! 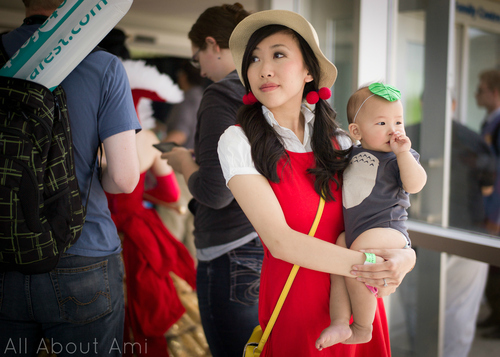 And here is Myla and I cosplaying together as Mei and baby Totoro! 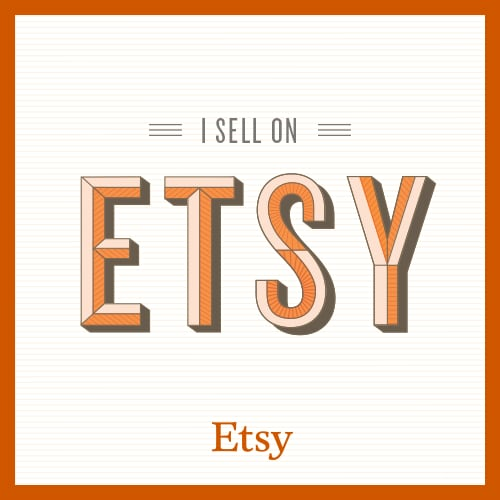 There are two other handmade pieces in the picture below! Ryan made Myla’s leaf headband out of felt last minute as we thought she needed some sort of accessory too. He also cut and glued some plastic leaves together to make this massive Totoro leaf that was easily visible wherever we went! 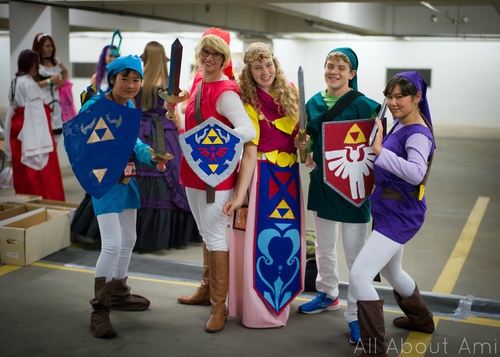 Here is our group costume together! 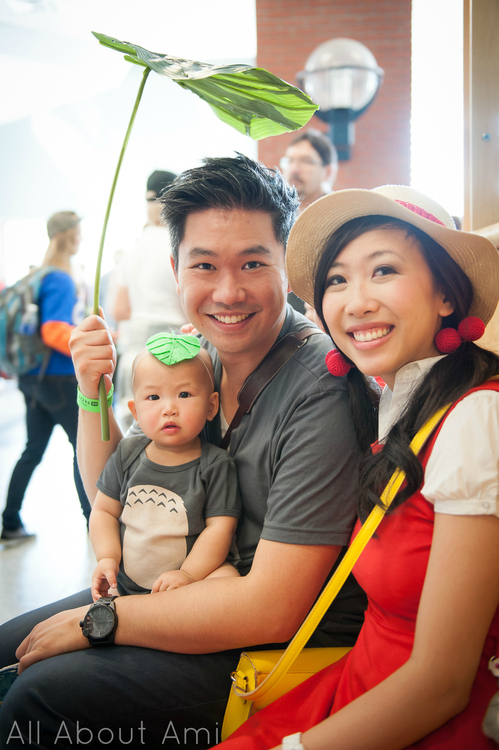 Ryan, my brother Corey and Myla are all Totoro’s! At first we were going to make their Totoro t-shirts by adding felt to grey t-shirts, but we ended up buying them from a site called “Redbubble”- they have some great designs. 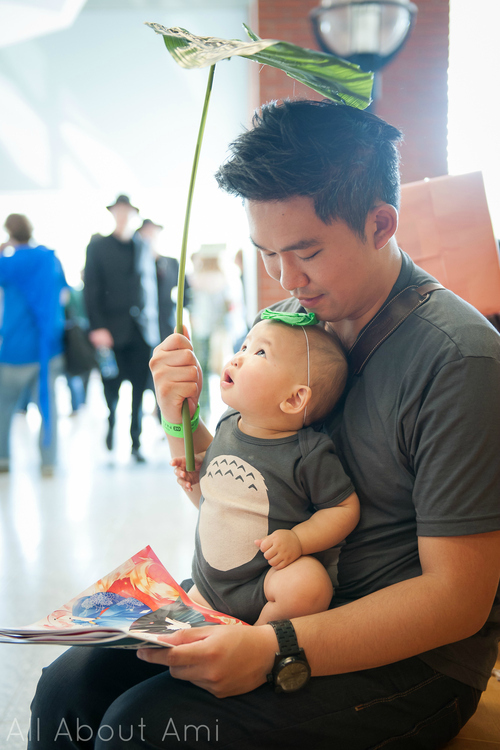 You can find Myla’s Totoro onesie here and the adult t-shirt here. Be warned that if you order from Canada it can take quite a while for delivery though- I had ordered these pieces a month in advance and was worried they were not going to make it in time! They took about 3 weeks to come in! Myla loved looking up at the big leaf! 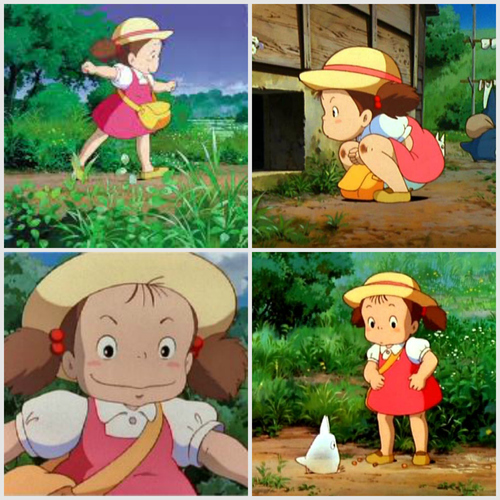 Isn’t she a cute baby Totoro? 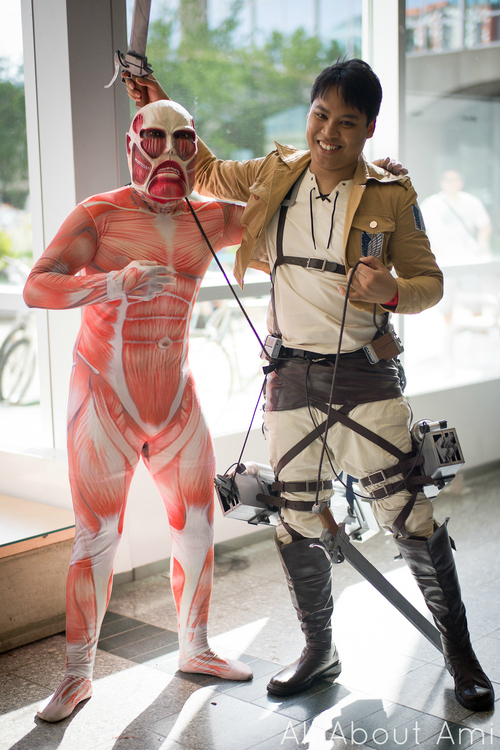 It was neat seeing everyone’s costumes and how much effort they put into them! 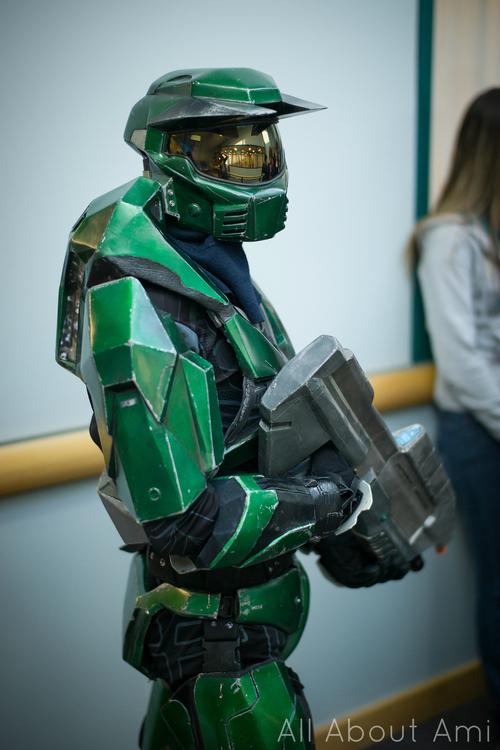 Master Chief was standing in front of us in line as we were registering. Myla was very intrigued by his costume. 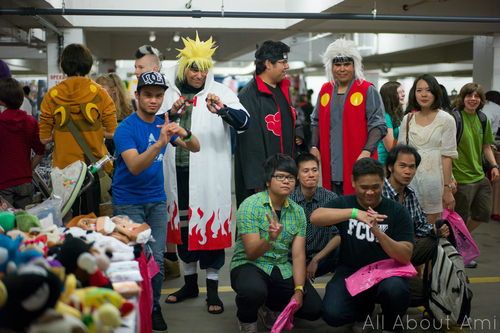 Walking around the vendor’s hall we came across some Naruto cosplayers. I looove Naruto although I am quite behind in the anime- the storylines and characters are so amazing! 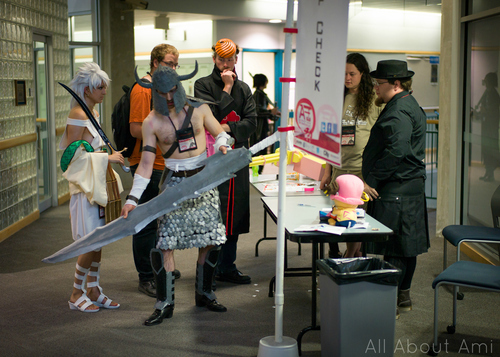 Here we are lining up to see the cosplay contest! There was so much for Myla to look at! Myla was getting tired so we took her to a quieter location for some peace. She ended up taking a nap in her stroller during the actual contest! Everyone loved Myla’s costume and it was cute seeing people recognize who we were when they looked first at Myla or at me. We had a fun time and we can’t wait for next year! Our dream is to go to Comic-Con in San Diego one year or the Anime Expo in Los Angeles 🙂 It would be awesome participating in something like our Animethon but on a bigger scale! Have any of you ever been? What is your favourite anime?